91 Westmuir Street, Parkhead, Glasgow. David Anderson's Auld Hoose. Circa 1910. 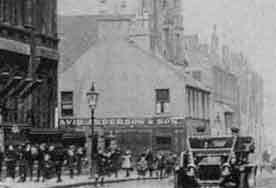 In 1892 the proprietor was Mr David Anderson, the pub was then called the Auld House. Mr Anderson collected antiquarian curios and fixed them on the walls in the bar. Over the years the place became cluttered with unusual things of interest, including a sea horse from the shores of the north of Iceland, in a grand glass, a fin of a whale captured in Rothesay Bay, a four week old crocodile from the eastern empire, the tusks of rhinoceros, antlers and the handle of one of the carriages in the ill-fated Tay bridge accident. Both the interior and exterior had an ancient look about it. Mr Anderson was a heavy smoker in his time, his wife always said that at night-time he would go outside for a smoke and would not come back in until 11 o'clock. Mr Anderson died in 1919 at his residence the Brae, Springboig and left an estate of £6753. Also see O'Kane's, Westmuir Street, Parkhead.